Chairs for use with our Computerized Polygraph Systems. 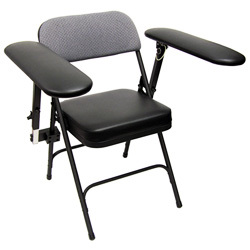 Chairs are available with or without built-in Activity Sensors, and different configurations of included Seat, Arm, and Feet Sensors are available upon request. Specially designed chair for examiners who travel or perform tests "in the field." 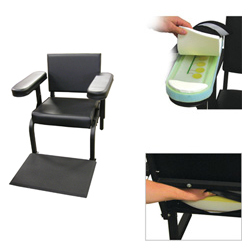 Includes Seat Activity Sensor Pad Model 76879S. 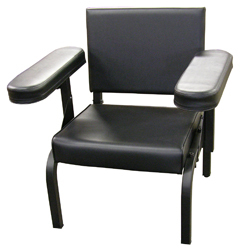 Our vinyl subject's chair with seat, arm, and feet activity sensors built into the chair! 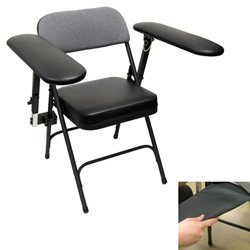 This chair is built to orthopedic standards to ensure proper posture and back support. Seat is covered in black naugahyde.